Inam-ur-Rehman's inclusion in the Indian team was the beginning of the end of Punjab's monopoly in Indian hockey. Indian Airlines repeatedly pin-pricked the bloated myth of Punjab's supremacy by winning tournament after tournament. The excellent performance of its players, drawn from all regions and from all religions, triggered criticism against biased selections. ince the 1948 Olympics in London in which Latif-ur-Rehman and Akhtar Hussain had represented India but were not played, no player from Bhopal had found a place in the Indian hockey team. Even when the great Inam-ur-Rehman, generally accepted as the best inside-left ever produced by the country, was playing at his peak for Calcutta's famous club Mohun Bagan in the early 60s, he could not find a place in the Indian team for the 1964 Olympics. Bhopal's hockey was seething with rage at the step-motherly treatment it was receiving from the Indian Hockey Federation (IHF). Ghufran and his close friends used to patronise a small tea shop below the Moti Masjid in the evenings. It was from here, in my opinion, that Ashwini Kumar's downfall as the president of the IHF began. Bhopal's rage at the IHF found expression in 1968 when Indian Airlines embarked on a sports promotion programme. The first on the list of its priorities was hockey. In their debut in the Jawaharlal Nehru Hockey Tournament in 1968 in Delhi, the Indian Airlines team, captained by Inam, and with 7 other boys from Bhopal, mesmerised team after team with their ball control, short passing, dodging and stickwork. Indian Airlines lifted the trophy on debut, shocking spectators and sports writers alike, that such talent, though available in the country, was being neglected. The shock gave way to questions from the press, and in 1968, Inam-ur-Rehman became the first Bhopal player to represent India in the Olympics, twenty years after another Rehman from Bhopal had been selected for the London Olympics. 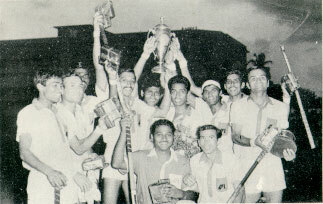 Inam's inclusion in the team was the beginning of the end of Punjab's monopoly in Indian hockey. Indian Airlines repeatedly pin-pricked the bloated myth of Punjab's supremacy in Indian hockey by winning tournament after tournament. The excellent performance of its players, drawn from all regions and from all religions of the country, triggered criticism against biased selections at the national level. The doors were opened to talent from other parts of the country, and from all religions. In 1974, Ashwini Kumar, the president of the IHF, stepped down under a cloud. The IHF, which had been paralysed by constant strife within the Federation, now began showing signs of fresh life.